Context-aware devices are possible with Bluetooth Low Energy, but battery life is crucial. In the early 1900s, radio beacons were created with the aim of tracking ships and planes. Prior to this innovation, pilots and ships’ captains usually relied on celestial navigation, and anyone who wanted to know their location was in the dark. Beacons, like most Bluetooth Low Energy node devices, are essentially peripheral devices that spend most of their time asleep only waking up when it needs to send data and thereby consume low power. With Bluetooth Low Energy, unlike classic Bluetooth, messages can be broadcast to unfamiliar phones – a paired connection is not necessary. Bluetooth Low Energy has a range of broadcast advertising modes which are used for the discovery and pairing process. However, these can also be used for general unacknowledged advertisements (non–connectable advertising mode) that can be detected by any phone with its Bluetooth receiver turned on. It is this mode that makes low cost beacons possible. Advertising packets had the ability to send out signal strength information, a local name and manufacturer-specific identifier, which was powerful. With Bluetooth 5, advertising extensions and 37 additional advertising channels, the broadcasting capabilities of Bluetooth beacons have dramatically increased, allowing transmission of about 8x the amount of data. What this enables is contextual awareness. Content and experience can be delivered based on the things we are ‘near’ – based on proximity to things in the physical world. This technology is transforming the physical world into a digital channel: ultimately moving from ‘What’ people buy/eat/watch/do to ‘How’ people buy/eat/watch/do. This real-time consumer data is the priceless output of beacon technology. This can be analyzed, sliced and diced to better understand the market and consumers, increase efficiencies and ultimately revenues and profits. There is an immense potential for everybody – or should we say every space. 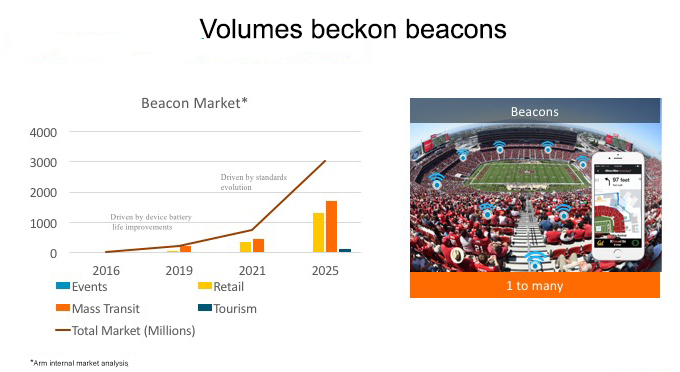 All these spaces have the potential to be “beacon-ized.” Silicon and solution providers hold the keys to unlock the potential of this market. With hundreds/thousands of beacons deployed in each of the spaces, this concept will not take off if one needs to change batteries every few months. Most beacons will need to be updated every 2-3 years due to the underlying technology it employs. The batteries in beacons should last longer than the rate at which the technology standards change. In the short term, for large scale deployment, batteries should not need to be updated before the beacon is updated itself. The need for extended battery life is being understood and such low-power, low-voltage solutions are beginning to be available. For instance, Arm’s Cordio product line provides complete, qualified low power solutions for this space. BLE chips designed with Cordio IP can get over two years of battery life from a single zinc-air battery. With such low-voltage and lower-power solutions, we can take this a step further. Billions of devices need not mean billions of batteries. Low voltage solutions extend themselves to energy harvesting applications. To truly enable the Bluetooth Low Energy beacons, we need to think thin (small cheap batteries), and think unattended (devices powered by energy harvesting technologies) and silicon providers need to take the right first step. Prithi Ramakrishnan is a wireless product manager at ARM.